Charlie Chaplin started appearing in his first films in 1914---40 films, to be precise---and, by 1915, the United States had a major case of "Chaplinitis." Chaplin mustaches were suddenly popping up everywhere--as were Chaplin imitators and Chaplin look-alike contests. A young Bob Hope apparently won one such contest in Cleveland. 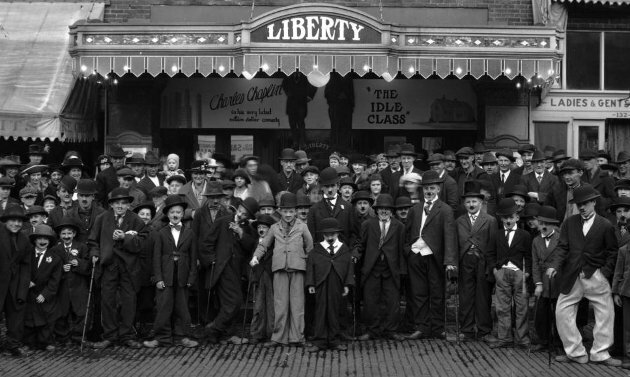 Chaplin Fever continued burning hot through 1921, the year when the Chaplin look-alike contest, shown above, was held outside the Liberty Theatre in Bellingham, Washington. According to legend, somewhere between 1915 and 1921, Chaplin decided to enter a Chaplin look-alike contest, and lost, badly. Lord Desborough, presiding at a dinner of the Anglo-Saxon club told a story which will have an enduring life. It comes from Miss Mary Pickford who told it to Lady Desborough, “Charlie Chaplin was one day at a fair in the United States, where a principal attraction was a competition as to who could best imitate the Charlie Chaplin walk. The real Charlie Chaplin thought there might be a chance for him so he entered for the performance, minus his celebrated moustache and his boots. He was a frightful failure and came in twentieth. A variation on the same story appeared in a New Zealand newspaper, the Poverty Bay Herald, again in 1920. As did another story in the Australian newspaper, the Albany Advertiser, in March, 1921. A competition in Charlie Chaplin impersonations was held in California recently. There was something like 40 competitors, and Charlie Chaplin, as a joke, entered the contest under an assumed name. He impersonated his well known film self. But he did not win; he was 27th in the competition. Did Chaplin come in 20th place? 27th place? Did he enter a contest at all? It's fun to imagine that he did. But, a century later, many consider the story the stuff of urban legend. When one researcher asked the Association Chaplin to weigh in, they apparently had this to say: "This anecdote told by Lord Desborough, whoever he may have been, was quite widely reported in the British press at the time. There are no other references to such a competition in any other press clipping albums that I have seen so I can only assume that this is the source of that rumour, urban myth, whatever it is. However, it may be true." I'd like to believe it is. I address the myth in CHAPLIN: GENIUS OF THE CINEMA (Harry N. Abrams, 2003). One of the greatest people of all time. As always, only white people were allowed. 20th place? I heard he came in 3rd place. As always, only white people are blamed.